Fresh from declaring ‘Make Love Not Walls’ in a campaign for inclusivity by renowned photographer David LaChapelle, Diesel collaborates with icon and activist Naomi Campbell for a collection that cares. 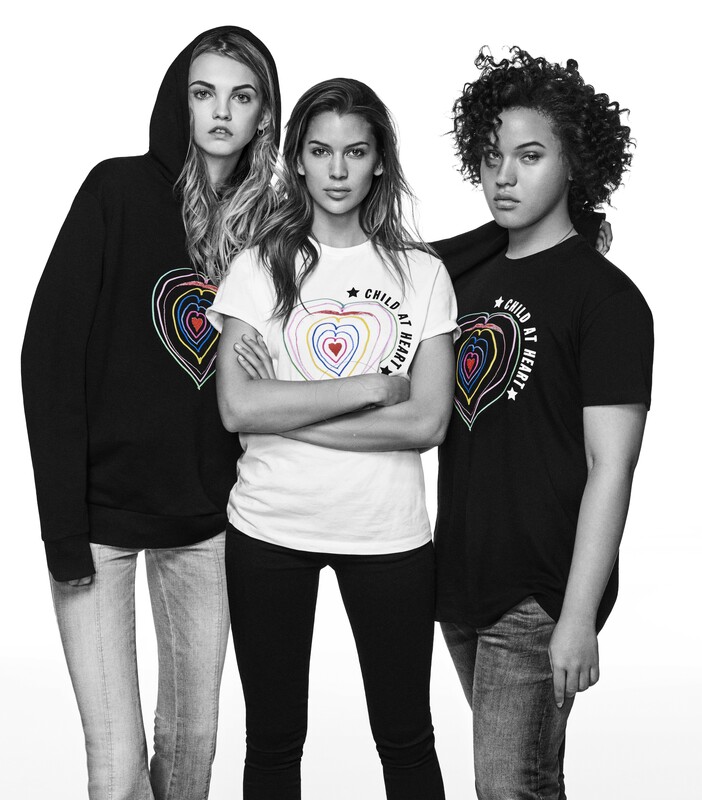 Through Campbell’s Fashion For Relief initiative, artwork designed by children – for the benefit of children – has been translated into a selection of t-shirts and hoodies. Called Child At Heart, part of the proceeds of these colourful loveheart and ladybird designs will be donated to Fashion For Relief. A quarter of children globally, 1.2 billion, are living in regions of developing countries that are left behind, whilst more than 230 million children have been forcibly uprooted from their homes because of crisis. One in ten children lives in a country that has been affected by conflict. Fashion For Relief was set up in 2005 with the aim to raise vital funds and awareness for global causes by working closely with other charity organisations around the world. It has raised over £4.5 million since its conception. The project was suggested by Campbell during the Milan amfAR gala of 2015, where she presented Diesel founder and OTB president Renzo Rosso with an award for his support of amfAR activities. Renzo’s own Only The Brave Foundation has the mission to re-balance social inequality and contribute to the sustainable development of less advantaged people throughout the world, and supports several initiatives for children and teens. For Naomi Campbell, this is a cause close to her heart, going back to 1993 when she started working with Nelson Mandela’s Children’s Fund, and continuing today with her own charity foundation. “Fashion For Relief works in emergency situations in conjunction with other charities on the ground. This amazing and special project will provide much needed aid and support for refugee children,” says Naomi Campbell. The co-branded Fashion For Relief x Diesel collection will be available online and through 145 Diesel stores globally. It is accompanied by a campaign photographed by Giampaolo Sgura featuring Campbell, Formichetti and a cast of talent including model, actress and Sports Illustrated ‘Rookie of the Year 2016’, Barbara Palvin; Kenya Kinski-Jones, daugh-ter of Quincy Jones and Nastassja Kinski; Aaron De Niro, son of Robert De Niro and Toukie Smith; Vine star Neels Visser and models Matt McMahon, Vito Basso, Riley Mon-tana, Molly Blair and Wang Chen Ming. Everyone involved in the Child At Heart project has worked without fee, driven by their passion to support this important cause. A Fashion For Relief charity event will take place on the 21st of May in Cannes, in con-junction with Diesel and Child at Heart. Αναρτήθηκε πριν από 33 mins.